Allow me to take a nostalgia trip through an experience I never had. 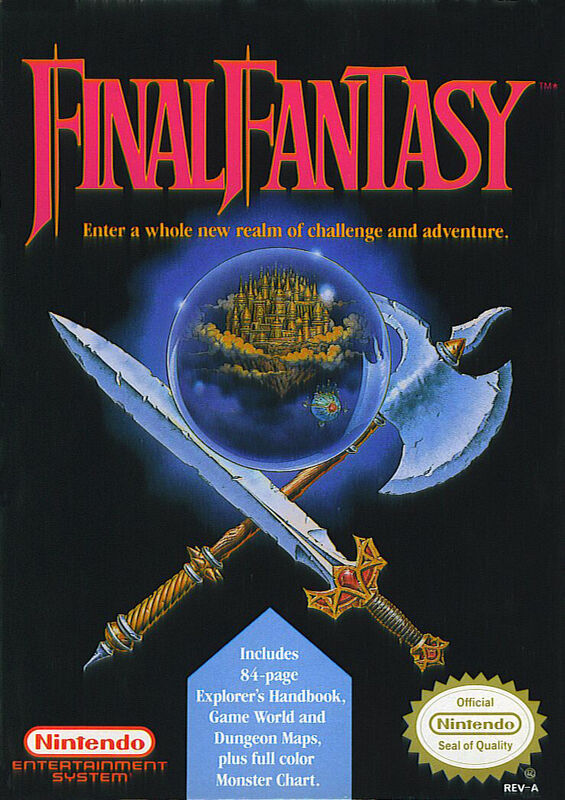 The first Final Fantasy game was released right around the time I was a very small boy. I mean extremely small, because I was a fetus. For obvious reasons, I did not play it upon release. But even as a Nintendo fanboy child I never got my hands on a single Final Fantasy game. It wasn't until high school when I discovered emulators that I played the 2D titles. (I've since purchased those six games.) So when I go back to the first ever title for some personal discovery it's not a look back at my life at all. Instead, I want to focus on the music of the FF series. The games are renowned for a lot of things, not all of them good. It's a series known for expanding upon itself and trying vastly varied iterations, despite people trying to convince you that they're all the same - you have both JRPG and Western RPG styles, multiple different animation techniques, 2D and 3D, single-player and MMORPG, and Medieval-Statis Fantasy mixed with Steampunk or Cyberpunk. The latest game does away with the turn-based combat and functions like an action RPG. But despite all the differences and the variance in quality as the series progresses, the music is consistently in top form. Let's dive in to the series debut and look at what makes this soundtrack stand out. There's loads that can be said, but for the sake of time, and my sanity, we'll just be scratching the surface. I'll do my best to present the analysis without too much musician-speak, but I can't promise anything. Throughout, I'll be linking to YouTube videos of the original Final Fantasy soundtrack, but any references outside the game you will need to look up yourself. Much of the music throughout the Final Fantasy (FF) series is the product of one man, Nobuo Uematsu. For the first nine main games, he was the sole composer. Later on the music was composed by a team of which he was the head, or a part of - though a couple titles have not seen his involvement. So as the games matured in style and found their footing, so too did Uematsu, and it's interesting to see the evolution of the games industry alongside the evolution of the composer's style. At the same time I want to be careful not to fall into the trap of creating a rags-to-riches story surrounding Uematsu. It's tempting to look at the soundtracks across the FF series and invent a story of a young musician who found his feet, so to speak, in composing. In this alternate universe, he awkwardly stumbled into his job at Square, learning composing on the go. While Uematsu certainly grew as an artist over time, that's normal for any artist. The soundtrack for Final Fantasy (FFI as it's known now) seems primitive compared to what we hear now, but this was not a result of an inexperienced musician at the helm. This wasn't Uematsu's first composition. This wasn't even his first composition for video games! More than a year prior he had been hired to write music for Square, and by the time he did FFI he had already composed about fifteen soundtracks. It's difficult to find most of this music now. Many of the games have faded into obscurity since the 80s. It's now widely known that Square was struggling and considered FFI to be a Last-Stand project (though what parts of the story are urban legend is still up for debate), to the point where you might be forgiven for believing FFI to be their first simply because it's the oldest one you've heard of. If you're interested you can find uploads of Uematsu's early work on YouTube. I recommend King's Knight, The 3-D Battles of Worldrunner, and Rad Racer. Fun fact: the primary track from Rad Racer was used as the theme music for Stinkoman, the Homestar Runner parody of Japanese cartoons. So a call from Square regarding a soundtrack to Final Fantasy was not a new thing for Uematsu and probably wasn't even considered a big deal. At the time, he was working at a rental shop and composed music for Square on the side to make a little money. He was already well-versed in writing game music in a number of styles, and this was just one more game to make. Uematsu's instructions were rather simple. Games back in the 80s couldn't handle massive soundtracks due to hardware limitations. Most of the time, games had two or three modest-length tunes and a smattering of stingers - short non-repeating tracks to signify important events such as completing a level, dying, or collecting an item. Dynamic scores that reflected what was happening on-screen didn't really happen then. A good NES soundtrack had only two qualifications: (1) the tunes were catchy and (2) the mood was at least semi-appropriate for the scene. I don't mean to denigrate at all - some of these soundtracks are among the greatest of all time. Sometimes you got a score that was really evocative of the scene or level at hand, but that was difficult to do with the limitations of early systems, especially one like the NES. There were only a few types of synthesized sound waves available to machines at the time, and the Nintendo Entertainment System used a small set of those. In addition to soundfont limitations, the NES could only produce notes in a somewhat small range. And most famously, sound channels were hard to come by. We don't worry about sound channels anymore, but back then, each individual sound produced by the machine would use up the entirety of a single channel. Some really old personal computers had only one channel, which was called a "clicker" or "beeper." Since each channel could only reliably sustain one note, producing chords required multiple sound channels. Of the NES' five sound channels, three could practically produce tones or pitches. Channels one and two were reserved for sine waves, and channel three for the triangle wave. The fourth channel could only produce white noise, or a static, hissing noise that contains no real pitch. Usually this became the dominant percussion track. Carefully controlled durations of white noise could imitate rudimentary drum beats pretty well. Finally, that fifth channel didn't have its own hardcoded sound, but instead was available to produce PCM samples. It was not always used, especially not for melody, since the samples didn't really sound in-tune. For instance, the timpani-ish sound you hear in Super Mario Bros. 3's Overworld Theme is a PCM sample, and it only sounds in tune on a couple of pitches. So, if you wanted to write traditional music on the NES, you had at your disposal three channels + percussion. If you're up on your music theory, three channels makes three notes, which makes one chord and nothing else. Game composers in the 80s had to be exceptionally clever and knowledgeable about voice leading if their scores were to be any good. After all, the simple act of creating a melody on the NES left only two notes remaining for the entire accompaniment. It took serious chops to create these scores so that the melody was always present, no notes were missing from the chord, and the voice leading wasn't spotty. For example, it was a good idea to have fanfares end on second-inversion chords instead of root position in order to have all three voices represented (see the original Super Mario Bros. and Super Mario Bros. 3 for good examples). Composers who could not only juggle all these limitations, but then produce the most iconic game music of the 80s, were in a class unto themselves. Uematsu has been called "The Beethoven of Video Game Music" before. Though I hesitate to compare him to Beethoven (he's probably much nicer than Ludwig), there is something to be said for how both composers expanded the sheer size of compositions in their field. In 1805, Beethoven wrote the Eroica symphony, which famously lasted a good two times as long as a standard symphony of the day. Then, in 1987, Uematsu did the same for video games, but without unsettling declarations of love to Napoleon. Shortly after, his record was beat by Super Mario Bros. 3, another gold standard of early video game music, but Uematsu took the record right back by doubling the length again for FFIII in 1990. And nowadays it's rare to find any video game with a soundtrack shorter than the original FF. In the above chart, the blue bar represents the total number of tracks in the score. The red bar, however, represents the number of tracks minus the stingers. "Stingers" are short, non-repeating tracks that usually mark some recent action, such as picking up an item, finishing a level, or dying. They're often 4 or 5 seconds long and don't contribute all that much to the size of the score. 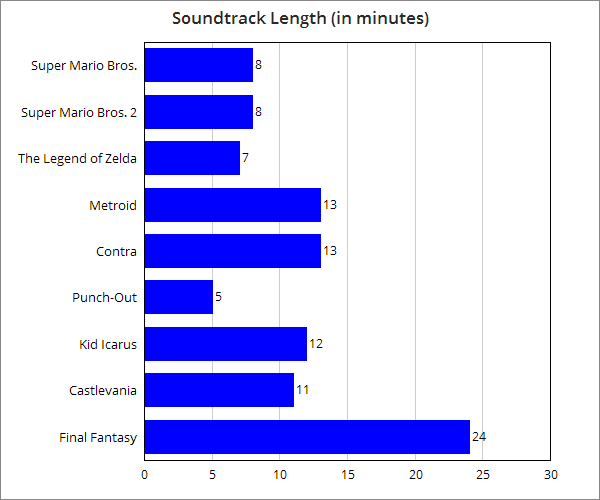 Counting only the main tracks gives a better look at the overall shape of the soundtrack and makes for a better comparison between games. Super Punch-Out, for example, has 20 tracks to FFI's 21, yet FFI is 5x the length. There is no way that Super Punch-Out can be considered a comparable soundtrack. But taking out stingers, the comparison between the two games is very similar in length and track count, somewhere between 4:1 and 5:1. This might all seem like a lot of fussing with the details, or missing the forest for the trees. But it's worth noting that before we even hear a single note of the score, Uematsu has by any reasonable metric blown the top off the industry. It may not have been his first-ever soundtrack but it was still very early in his career and he had nowhere to go but up. The times are calculated as if you play each non-looping track once, and each looping track twice with a fade-out period. These times listed are rounded to the nearest minute because there is no rule on how long that fade-out period should be. For this article I've only considered games that were released in the U.S. There may be Japan-only games that break the formula, but I can't find enough information on them. I am open to the idea that by 1987 there were one or two outliers. "The Prelude" might be the most famous tune from the series. It appears in just about every single title, usually at startup or very close to it, and it's extremely simple and memorable. Who knows if Uematsu planned things that way from the beginning, or if he even named this tune "The Prelude." Games in that era tended to have merely descriptive titles for tracks, titles like "Overworld Theme" or "Game Over." Sometimes I wonder how much of the nomenclature came from the composers themselves, since you can find discrepancies in titles if you look for them. This applies even to The Prelude: you can find rips of the soundtrack on YouTube that use either that name or "Title Theme." My guess is that the more fanciful titles have been retroactively applied. As far as we know, Uematsu wrote this tune with no further plans to make it a series favorite. I mention this as a warning to musicians to not apply today's standards to older music. And now I shall completely ignore my own warning and analyze this tune. The effect - the top staves are the main melody, while the bottom ones are delayed two sixteenth-notes. In later games, the arpeggio does in fact stretch for the full four octaves, but because the NES couldn't simulate the sine wave below C3, you get what you see here. Rumor has it that Uematsu composed this whole tune in about five minutes while under the gun. While that sounds too good to be true, it's not far-fetched to think he couldn't compose eight chords that quickly. The arpeggio figure above remains consistent throughout the whole track, changing harmony every two bars. This gives us an eight-chord progression, which we can further divide into two phrases of four chords each. The first phrase simply alternates between the two chords in the picture, Bb and Gm. To be specific, we have Bb(add2) and Gm(add2), but for now the simple chord names will do as the added 2nds aren't really doing anything beyond adding color. We're in the key of Bb, so this gives us the I and vi chords. These are great for emphasizing statis, as there's no directionality implied between the two. That first vi chord returns to the I as quickly as it came, and so it's really being used as an extension of the tonic. The second half really holds the harmonic motion in the form of four rising chords, simplified as Eb-F-Gb-Ab. But instead of being one rising string of chords, this really feels like two sets of two. The bass not always being on the root helps with this feeling. Since the first two chords are in first inversion, the bassline ends up being G-A-Gb-Ab... not a very clear path from IV to I. Instead it feels like two separate approaches, two separate sub-dominant to dominant motions. In fact, if you split this section in half, either half would lead appropriately to the beginning again. You could move from Eb-F-Bb just fine, and do the same for Gb-Ab-Bb. In both cases the first chord acts as a sub-dominant and the second as the dominant, though in the second case it's done in a very 80s way. Condensed version of the entire prelude. For the roman numerals I'm just going for simplified versions of chords to show the relationships between them, as this type of analysis doesn't really work well for anything else past the late 1800s. It is pure harmonic invention without melody, just waiting for some tune to take it over. Uematsu would do just that for FFIV on the Super Nintendo Entertainment System, but on the NES there just wasn't the capability. However, due to its simplicity, The Prelude is a prime candidate for variation, and it works perfectly to introduce any title in the series. Other recurring themes wouldn't fare so well. Sorry fans, but that chocobo theme sounds clunky when transported into a "serious" style. Aside from the Prelude, there's one other recurring theme in FFI ubiquitous to the series, and it's called - wait for it - "Final Fantasy Theme." It's strange how this tune was meant as the actual theme when The Prelude is the more recognizable. Still, both are good representatives of the series as a whole and feature in most every game. With its easily segmented form and traditional harmony, the Final Fantasy Theme is probably the most "classical" of the tunes from this game. But Uematsu had to mix things up a bit to make the theme work in a looping track. Ordinarily a piece in the classical style would have a chord progression with a strong beginning, middle, and end. Trouble is, looping tracks aren't supposed to end, so a traditional progression would have a very recognizable halt as we ended the theme and restarted it. So most tunes tended to run beginning, middle, beginning. Phrases and whole tunes ended on V so as to more easily lead into the start. In fact, with the Final Fantasy Theme, every phrase ends with a V.
A traditional piece might function like this, but by having such a strong ending feel the loop will sound unnatural. It ends clearly on tonic and on a nice long note. Great for generating applause after a show, but severely noticeable in a game. By taking advantage of the V-I pattern, this loop never sounds like it has to stop. The ending perfectly goes back to the beginning. Constant flow. This was common for all video game composers then, not just Uematsu. A - restate the theme but this time end on tonic. A - which decisively ends the piece. The A section of the Main Theme. Here I've tried to represent most accurately each chord, though I only wrote the notes for the melody and bass. It's a very classical sounding tune. And if you're a gamer, you've likely heard it a million times, to the point where you don't realize just how un-classical the whole thing is. The descending bassline in the first bar seems normal - straight out of Bach's "Air on a G String" - but the chords above it aren't what you would expect. Why does IV go back to V instead of a cadential 6-4 like you'd hear in a "real" classical piece? Why does the Gmsus chord's resolution land on a different suspension on the next chord? To top it off, in the first bar there's a parallel fifth, the worst sin of all. Clearly, this is not a classical piece. Yet it sounds old-fashioned, and therefore high-class, to us. Why? Independent Voices: While the melody and bass do their own thing, there's an additional line moving in the middle which has yet another unique melody. It's rare in popular music to do that. Lack of Syncopation: Modern music uses syncopation as a feature, whereas classical music treats it like a dissonance - something interesting which must be adequately prepared for and resolved. The FFI Theme treats syncopation closer to the classical style. Uematsu applies liberal syncopation elsewhere in the game, so it's not like he doesn't know how. Large Melodic Range: Though it's not exclusively a classical trait, having a melody that soars a minor 7th in the first bar is not going to show up in modern pop tunes that often. Square Rhythms: There's always a fresh note on each beat of the bar. Chords change regularly. Beats are divided simply. Tonic-Dominant Focus: Though the above pictures make the tonal inventory seem large, for the most part this is a play between I and V. When the Gm consequent phrase occurs, the D chord is treated as its dominant. Harmonic Progression, not Pattern: Modern music tends to divide songs into phrases, where each phrase is a set number of bars (usually 4), and each bar only one chord. The chords themselves matter little, so long as they aren't incredibly dissonant. Then you simply repeat that 4-bar pattern until you've made enough money, then you pick another one. Classical music, however, has harmony which implies direction. This chord must be followed by that one. V goes to I, and so on. There are rules. Though most people aren't aware of these "rules," they know it when they hear it. And by using these qualities, Uematsu makes music which sounds classical, even though other rules of classical music - rules that fewer people know - are broken left and right. In fact, in the B section he strays further from the classical mold. I'm not even going to bother with the complicated one. What's Ab doing there? What's it doing modulating to Gm? And how do we get from Gm to DbMaj7? It turns out Uematsu set up these crazy harmonies from the beginning. In the A section we had two phrases of two bars, an antecedent phrase beginning on I (F major), and a consequent beginning on ii (G minor). When we get to the B section we're still playing with the same two chords, F major and G minor. Everything else is somehow in relation to those. Eb-D-Gm is a simple VI-V-I relationship which does show up in classical music. The same VI-V-I appears in that fourth bar, this time with F major as the I (you won't hear it until the A section starts again). The bIII is the outlier, but maybe it's functioning as the bII to the G minor scale (sometimes called the Phrygian II), so it's not as far out as we thought. It's still the only time in this tune that we have such a relationship, so Uematsu saved it for the climax of the B section to make it special and ensure we don't hear it too often. Looking at the music this way, we can see that Uematsu is working two jobs. On one hand, he's creating an iconic tune that stands up on its own. But then he's put in work to make sure that tune conforms to general stereotypes of classical music so that we attribute it to that style even though it has adventurous harmonic motion. This is the bassline for the Battle Theme of FFI... and II... and every game of the first six. At least it's an exciting bassline, and an exciting tune. But there's one thing this track is missing: percussion. Remember the NES could technically handle percussion, sort of. It had the dedicated white noise channel and the PCM channel, but neither were used in this track. Using those channels wasn't some sort of mystical art known by only a few, either. Uematsu had done it before in previous games. But here, he doesn't use percussion at all. In fact, in the entire soundtrack for the game, he doesn't use the white noise or PCM sample channels for the music. This definitely gives the whole soundtrack an old-fashioned feeling, since classical music has always been light on the percussion. But that's not likely the reason Uematsu left it out of this track. It's more likely a sound-channel issue. Recall that the NES could only handle a few sound channels at a time, so if every single channel was always playing, then any game action that provided sound effects would have to interrupt one of those channels in order to play. The battle scenes used percussive sounds for a lot of common actions. By not using the white noise channel at all, Uematsu can guarantee that any sound effect using that channel has free reign. It's not a perfect system, as there are sounds that use other channels, but it's still a smart move. Removing percussion in a time when video games were trying to make the coolest rock music means the soundtrack stands out in addition to being smart with its resources. But now, how does Uematsu make exciting, tense music without percussion? Battle Theme in G minor. It's not as if the major version is the same, but just a bit less tense. No, the two belong in completely different genres. This is something you see everywhere! Mario music is generally in major, but Bowser's Castle is in minor. The Hyrule Field Theme from Ocarina of Time is in major, but when you see an enemy it switches to minor. It's such an easy trick it's done to death, but it hasn't stopped working yet. Another trick is the reliance on the tritone, the most dissonant of intervals. The opening of the melody jumps a fifth and then falls back onto that C#, which sounds in sharp contrast to G. In the third and fourth bars we do it again, G-D-C#, followed by the same motif up a third at Bb-F-E.
All this to bring us a track that fans still go crazy for even though there's no "epic" drumbeat and the bassline is just a triangle wave. From here on out I'm going to lighten up on the analysis a bit. While it would be fun to map out literally every single track, I realize this is already getting to be a very long article. So I'd like to provide some extra thoughts about the rest of the soundtrack and wrap things up. In FF, you play a party of heroes tasked with restoring four orbs with elemental powers so you can fight Chaos and return the earth to the way it was. Thus the game is divided into five distinct chunks, one for each of the elemental orbs and then one for the final fight. And for each orb dungeon and for the final dungeon, there's a special dungeon track. Well, almost. The tracks "Gurgu Volcano," "Sunken Shrine," "Floating Castle," and "Temple of Chaos" are named after their levels, but the Earth Cave's track is just called "Dungeon." It's used not only for this cave but for all mini-dungeons in the game. This strikes me as a mistake. Why go through the trouble of inventing a special tune for each special moment only to reuse one of them all the time? Also, the "Temple of Chaos" and "Sunken Shrine" tracks are criminally similar. But that's just me. It's pretty widely known that Square gave very general directions to Uematsu for this game. They gave him basic ideas for tracks, such as a town theme or inn or castle, and then just let him loose. Perhaps there was no original plan to make each main dungeon unique. I'd believe that... if there weren't exactly five tunes to fit five story-important dungeons. All of the overworld tracks are just fantastic. Take a listen to the main theme here, or the ship theme here, or the airship one here. Such a shame you'll never here the entirely of these tracks (except the airship one, I'll give you that) unless you stop playing the game and just sit there. That's because the encounter rate is so high that you'll be facing monsters every three or four steps. And every time the overworld reloads, the theme starts over. There's a lesson there, video game composers: don't bother writing five minutes of music for a ten-second scene. Unless you're Uematsu. Then you can do whatever you want. It's also really annoying to switch to a new theme every time you open the menu. Later incarnations would just keep playing whatever track was already going, but for FFI, when you pause the game, the current track stops dead. Then this annoying tune starts up, and when you're done messing around in the menu, the in-game music starts over again. What a joy. And due to the obtuse stat system (which is riddled with bugs) you're going to use that menu a lot. Doo-do-doo-do-doo-do-doo-do-doooooooooooooooooo-do-doooooo-do-dooooooo, indeed. Matoya's Cave is pretty cool. It's a crowd favorite, even though it only plays in a couple of places, such as - you guessed it - Matoya's Cave. Its popularity might be because this is the closest thing FFI has to a pop tune. After all, it starts with the four chords of rock (vi-IV-I-V). Why is there a separate track for entering shops? It's just one more reason to halt the town theme and interrupt it with a blaring jig a la the menu theme. Maybe it's just me, but I find this track - along with the menu theme - to be the least fitting in this otherwise totally unified soundtrack. Oh, and does anyone else think it's strange that there's no special music for the final boss fight? Apparently Uematsu and Square thought so after release, because every FF game after this one has special music for the epic showdown at the end. In all seriousness, my gripes aren't with the actual music, but how that music is used in the game. Uematsu and Square learned a lot from this project, and later FF games would focus more on making the music fit with whatever was happening in the game. Nowadays some of the track choices seem jarring, but for 1987, this was an unpredecedented soundtrack. Because the games industry has evolved so much since those days, and the 80s look so primitive in comparison to our games today, it's very easy to imagine the designers were similarly primitive. FFI should prove the opposite. In fact, there was never really a time in video game history when the designers were artistically immature, even when the medium as a whole hadn't found its feet. Some really great music is out there. People still listen to it, for fun, without having to play the game. Heck, I'm one of them, since I didn't play this game until I was in high school. Even then I own the updated re-release for my phone. But when I go to listen to this soundtrack, I prefer the original. Actually, if there was a way to play the updated game with the original soundtrack, I think I'd buy that. Get on it, Square Enix. Congratulations on your simulated guitar fret noises, but I like the sine waves, thank you very much. Anyway - it's a landmark game in history. Final Fantasy changed the industry in a good way, and a lot has been said on how its design has influenced later games. But very little to nothing has been written on what the music did. FFI treated its soundtrack like a score, beyond what other games had tried in the past. And every tune is a classic. Except maybe that menu theme. I hate that menu theme.